WASHINGTON, DC – Illicit trade in “goods, guns, people, and natural resources” is a $650 billion enterprise, which most negatively impacts the developing world, finds a new report released today by Global Financial Integrity. 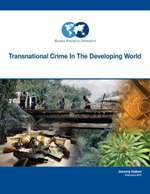 “Transnational Crime in the Developing World,” evaluates the overall size of criminal markets in 12 categories: drugs, humans, wildlife, counterfeit goods and currencies, human organs, small arms, diamonds and other gems, oil, timber, fish, art and cultural property, and gold. The report is available for download at http://transcrime.gfip.org. Questions may be directed to Monique Perry Danziger at mdanziger@gfip.org or +1 202 293 0740. Global Financial Integrity (GFI) is a Washington, DC-based research and advocacy organization which promotes transparency in the international financial system. GFI is a program of the Center for International Policy. For additional information please visit www.gfip.org. This press release was originally published here.